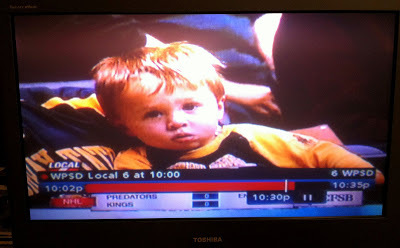 My sweet, sleepy boy made WPSD-TV’s story on the Murray State versus Tennessee State basketball game last night. This would be his tired, dazed expression, which happens when he decides not to give into sleep. Yes, I know, silly momma expecting him to sleep during a basketball game. But, hey, he’s done it many times before, so experience influenced my expectations. Ben usually goes to bed at his self-imposed bedtime of 7 p.m. The men’s basketball game starts at 7:30 p.m. Yeah, it doesn’t take a mathematician to figure out why he was tired. Usually he’ll just give in, but last night he cried about it for awhile, drank milk, told people around us “nigh-night,” and then randomly clapped his hands just as his eyes would start to close.